I spent my Christmas at Disney World this past week and these were lines from the live Dream Along With Mickey show at the Cinderella Castle. This was the first time I’d seen this show and some of the lines above struck me more than I thought any Disney show could -- and it reminded me about sharing with you some of the most important tips I have to help you make your dreams come true. A few things stood out to me in this show and I want to share them with you so you can reflect on your own dreams this year and actually make them come true. Sound impossible? Sound cheesy? Then you might be a Donald. What struck me most when this show started was Donald’s stubborn attitude. It seemed even Disney knew in these recession and post-modern times that most people see “dreams” as a silly and naïve notion. And thus it needed to be addressed that in these times it often feels like “nobody believes in dreams anymore.” What about you? I have to admit, I’m an incurable Mickey. I still believe in the power and beauty of finding something you care about, are passionate about, are excited about, and making it happen. I believe it takes a lot of hard work, sacrifice, failure, and perseverance. But I believe it starts with believing. And I believe you can make your dreams come true. I know it may sound ridiculous that my eyes watered at this point in the show but it’s because I’m such a Mickey. I thought about how deeply I do believe this, and what made me both happy and kind of sad is thinking about how many beautiful children and people in the world don’t - can’t - find or believe in their dreams because they don’t have anyone in their life to tell them that who they are and what they bring to the world is so valuable. Do you have people like this in your life? Do you believe? Or have you lost that? What I’ve learned this year more than anything is the incredible power unleashed when someone else believes in you and sets your heights higher than you could have ever set for yourself. But, the thing is, not everyone always has these people in their lives. Which is why we can’t always rely on others and must find it within ourselves. You have to believe in yourself and believe that if you believe in yourself, define your dreams – whatever they may be – and believe that anything is possible amazing things will happen in your life. And though it may not mean much, I believe in you. The only catch is, believing in yourself is really, really hard to do. It’s easy to feel like a Donald. I have my Donald moments too. What do you want to happen this year? Have you defined your dreams? Are you excited about your endeavors in 2012? Do you believe you’re capable of achieving them? Dare to be optimistic in a pessimistic world. Believing is the first step. But simply believing alone is not enough. You can’t just wish your life – you do have to take action. And I have found the best way to start is to write down your goals and be specific. I’m not talking about resolutions. As one of my favorite authors Christine Hassler says, resolutions don’t work because they’re just about trying to do something “more, better or different.” Her New Years ritual is my favorite and I highly recommend you do it! I did mine two days ago and added a few things. In addition to doing Christine’s practice I also did a watercolor painting (I am not an artist but got a watercolor set for Christmas and have been having a blast! 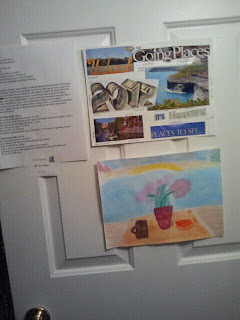 My skills are on par with a 4th grader’s, and I have as much fun as a kindergartner) of an ocean view that I dream of having one day. I also made a collage of pictures and words that represented who I wanted to be and what I wanted to accomplish this year. It was so much fun and now I have great visuals that I’ve taped to my closet door along with a typed document that lists my 6 goals and a short paragraph I wrote last year that explains who I want to be (written in the present tense). The final step that I will be doing today is turning my dreams into specific measurable goals. Writing down these measurable goals are not about putting pressure on yourself, but about defining specifically what it is you want to accomplish so that you know how to best prioritize your time and energy. I tape my goals to my mirror and see them every day as a reminder to think about how I’m spending my time. 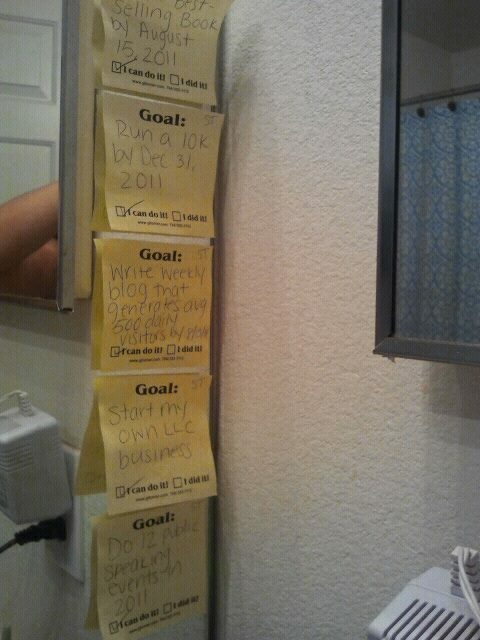 All of my goals pictured above came true this year except for one (running a 10K). I wrote this in the winter and at the time loved running outside in the cool weather. But in Florida….I realized I only liked to run about 3 months out of the year. I don’t beat myself up over this. I simply reflect, think about why it didn’t work, and will be creating a different fitness goal for myself this year. The most powerful part of this process is it reminds you of your priorities. It’s so easy to get bogged down in the unimportant. Define what you want, and if you see it every day you will spend the time necessary to make big things happen and eliminate the wasteful ways in which you spend your time this year. Be very specific and measurable. Have a due date and don’t make all of them Dec 31. Give yourself goals that have due dates throughout the year. Have about 3-6 goals. Focus on things that really matter to you and don’t overwhelm yourself with too many things to accomplish in one year. The more focused you are the more attainable your goals will be. Reach and be realistic. When I say realistic I don’t mean you should sell yourself short. You should reach as high as possible, even a bit higher than you think is possible. However, be realistic when it comes to your strengths and talents. And most of all, be realistic in writing goals you really care about, not things you think you “should” write…because those won’t work. Reflect before you write your goals and don’t be afraid to dream big. Start by writing all of your goals out without thinking and then narrow them down to what is really important to you. Write, showcase, and share them anywhere and everywhere around your room so you can see them every day. I know both Christine and mine’s processes seem to take a lot of time and energy. But I promise you if you dedicate just an hour or two to this process and really do it completely, you will have year unlike any you can ever imagine. I know this because last year I did this all of this for the first time and had a year that was indeed a year I could never have believed. I still literally can’t believe it. Carving out that time and focusing on what is really important to you will make all the difference in the world for your 2012. What in your life would you like to accomplish this year? You can make it happen! Block off some time for yourself in your calendar right now to reflect and write about what you want to do this year. Invest in your life – your dreams. And believe they are possible.